“I’ve sold five million records. Somebody calls it singing,” Elvis quips to a reporter questioning what it is he actually does. It’s an odd moment, but it gives a slight hint at what 1956 must have been like for Presley. He’d already made a stir, but after recently leaving Sun Records for RCA, he released “Heartbreak Hotel” in January, kicking off a string of No. 1 singles along with the year’s two No. 1 albums, Elvis Presley and Elvis (setting the tone for a creative album-naming trend). He’d also reach the big screen that year and would pretty much be The King. 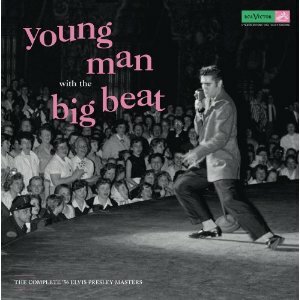 Young Man with the Big Beat captures that year in complete details over five discs, perhaps going a little further than necessary. The first two discs contain the masters from those two albums along with the tracks from singles and EPs. The two albums hold up well, and there’s joy available in revisiting them in an effort to remove the then-Elvis’s future from a listen. The debut’s especially startling—the influences are everywhere, and even with the Sun sessions in mind, the music seems as novel as it could have been scattered, the country and rockabilly sounds finding partnership with gospel and R&B. It’s not Ray Charles, but Presley’s “I Got a Woman” marks important territory for him, just as the album itself would be a pivotal release for rock ‘n’ roll, which, it was discovered, could support the album format. The second album is nearly as impressive and probably only falls short because of the impact of first hearing the debut (and it doesn’t help that this disc’s Little Richard cover “Long Tall Sally” doesn’t match the previous album’s “Tutti Frutti”). Singles like “Hound Dog,” “Don’t Be Cruel,” and “Love Me Tender” outshine the album, but such comparisons are almost silly given the negligible variance of quality in Presley’s 1956 material. ?All that ground has been fairly well-covered, so the real treat from the Young Man box comes with the disc of live performances. In interviews, Elvis repeats the need to give a live audience something other than what they have on their records. One of the most representative images of Elvis is him on stage, sweat dripping and fans screaming, and this disc captures that feeling. The final set here comes from a previously unreleased Dec. 15 show in Shreveport, La., which was his return there after months away from his Louisiana Hayride gigs. The audience has lost it, and Elvis is all energy and raunch, and the band matches him, whether slinking through “Love Me” or pounding through tracks like “Hound Dog”. The outtakes disc makes for a poor following. The performances aren’t bad, but they’re not differentiated enough to be particularly insightful. Most of the space is given to multiple runs of “Lawdy, Miss Clawdy” and “Shake, Rattle and Roll”). The band might be working out its sound, but within such a refined range that there’s little to warrant repeat listens here, and it’s the first moment the box has sounded like a completists-only set. The interviews that end disc four and make up disc five are somewhere in a middle ground. For the most part, they’re a stream of inanity, not so much from Presley or Colonel Parker, but from the journalists. In that sense, though, it’s a wonderful peek at the time, in which it seems no one quite knows what to ask a rock star (or, for that matter, what a rock star even is). We see a recognizable sense of the tabloid fodder without the contemporary salaciousness. We’re treated to repeat questions about cars (he has four, not all Cadillacs) but no one gets to the interesting follow-ups along this mundane line: Why and how a Messerschmitt? Parker spends a fair time defending Presley’s breakfast habits (one egg, or no more than two). For the record, blondes don’t scream at Elvis at a disproportionate rate compared to women with other hair colors—including gray. It’s more fun to hear Elvis talk as a hobbyist about movies, with the loose idea that he might get to do one someday (that day would come later that year, with Love Me Tender. It’s less fun to hear the talk about Elvis’ conditioning, and the general concern that he wasn’t taking care of himself. We do see a little bit of a backlash developing in some of the questions, particularly as Paul Wilder digs into some of the negative reviews Presley has received. Elvis sounds more concerned with defending his fans than himself, although he does need to clear up some misconceptions. He doesn’t sound as bored as he probably should with explaining yet again where his gyrations come from (there’s no great mystery here), although he does point out how “childish” the media-created name “Elvis the Pelvis” is. Presley’s answers aren’t informative to listeners 50 year later, but the nature of the interviews are. The outtakes and the interviews offer more content than the typical fan needs, but they do help develop a larger picture of Presley’s 1956. That said, it’s really the music that matters, and there’s plenty of that here to satisfy. While a lot of the recordings are beyond familiar by now, they work well in this sort of set, especially supported by the live material. Apparently, 1956 was a pretty good year. No wonder he was singing.